Like a beacon of light on a dark night. We are well known for being one of, if not, the first around to have a large fire pit. Whether it’s a crisp night in the Spring or Fall, a Snow Storm in the middle of Winter or 95 degrees in the Summer our Fire Pit is on whenever we are open. 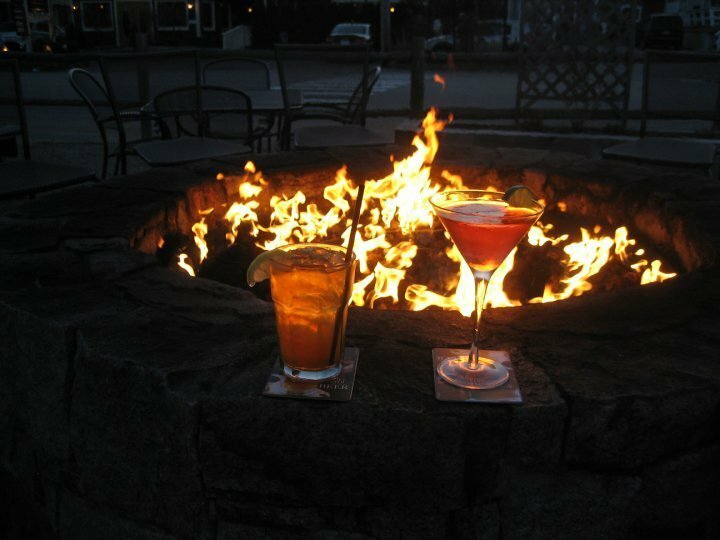 Join us for some food or a cocktail by the Fire Pit, see you soon! Staff: First and foremost, we have an amazing loyal staff that we like to call “Our Family”. A majority of our “core” year round staff have been with us for many years. We also have a fair amount of seasonal help that returns every year as well. We would not be able to do what we do without all of our fantastic, hard working staff. Thank you staff!! Food: We specialize in smoked food such as BBQ, Seafood, Cheeses and more! We love to get creative in what we try to smoke and will try almost everything. We take pride in making almost everything by scratch to ensure fresh and delicious food. We care about what we do and want to make sure that you leave satisfied. Bar: At Beachfire we like offer as many local rotating beer and spirit selections as possible. Local for us consists of all of Maine and most of New Hampshire since we are close to the border. There are so many great breweries and distilleries around that we love to showcase what they offer. Join us for a drink with friends, to watch a game or to enjoy dinner. Think Beachfire!